If you are the Superintendent of a school district on Long Island, or in New York generally, the time to act is now. Bring top-level, world leading technology education to your students and teachers today. Join us and collaborate with teachers, developers, students, administrators, parents and mentors in making the future of learning... one tool, one lesson, one exploration, one partnership at a time. You could spend over $1,000,000 to hire and develop the educational capacity and opportunity for your students in grade K-12 to build computer science and engineering skills. You could let months/years pass while kids graduate into a world where these skills are already MASSIVELY important skills, in order to create such a plan. 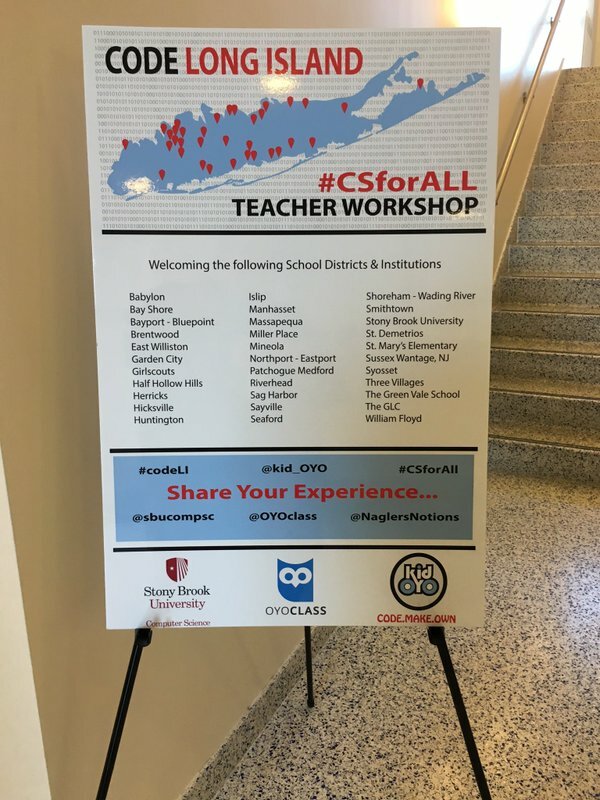 You could miss a world-changing opportunity to do more than just teach about technology, innovation, and creative collaboration among talented people... or YOU could lead... by action and voice... as a producer of a uniquely Long Island effort to build powerful learning outcomes in all our schools. Code Mineola has been active for more than an entire year for all students K-12. All of our kidOYO programs and CodeLI.org programs at Universities on Long Island are growing... and we need partners because we host events with over 100 students on the waiting list just trying to learn the basics of programming because there is more demand than capacity in our schools. Only leaders are going to create the opportunities and top-notch learning solutions our area needs and wants! Code Huntington is live! Code Garden City is live! Code Amityville is going live as I type...! Don't hesitate. This is about giving superpowers to your teachers and your students. Our approach does not make existing talent less valuable, it makes them more powerful, useful and influential. It makes great teachers even better. We built it to serve our own teaching needs, and honed our methods over the past 15 years of effort to yield a tool like no other. The world is going to play catch up to what is already happening inside of every OYOclass.com community, the question is will you be leading or catching up? Long Island, NY needs a plan to set itself apart as a region that can self-sustain and self-perpetuate an approach to coding education that will lead our talented young people into leadership roles across the entire world. kidOYO is making that possible. New York State, requires a sound and effective plan for producing top-quality computer science/engineering education in order to enable the diverse pursuits of our people to be supercharged by skills that develop unique capacities, both locally and on a National & Global stage. OYOclass.com is tested and ready for deployment. Starting in Kindergarten through 12th grade, and into University classrooms, every student requires access to the basic training and tools of computational thinking. Across the spectrum, students NEED the ability to tell the stories of their learning, to do the homework they are tasked with, to share their creative projects and own their own micro-credentials showcasing how their learning portfolio is developing real skills, usable in the real world. We have a National Emergency; proficiency with the root creative tools of data, information, work, logic and increasingly "everything" that coding touches... is a survival skill, and one that economies will be altered forever by. Every Society across the planet must have skilled people to compete locally, because every skill, resource, and outcome that can be accessed via the internet, is competing with local opportunity. No business is secure from global competition, no industry is immune to global skill shortages or competition. Our institutions of education, health care, governance, scientific research all have a real stake in this problem, because without real skills at the root layer of computational thinking, skill development and outcome development take much longer to support and produce, if and where possible at all. Tapping on apps, dragging your finger across a screen, posting comments on any social media timeline, telling stories with video, building ideas with blocks in digital sandboxes, using bananas as conductive material in constructing musical instruments with micro-controllers... and much more... these all live atop the root experience and skills and tools of creativity enabling them to exist. Our schools must know how to begin feeding young people these skills, tools and experiences at root personal creativity. Our kids want this opportunity yesterday. This message, "CS Education For All" is realistically 10-20 years late... and most schools are not only running that far behind the curve, but have yet to take any substantial action on fixing this aging problem. Computer science and engineering are enabling science and creative pursuits, meaning that they enable other pursuits, rather than exist in a void trying to simply solve their own problems. CS/E applied to biology and medical research is a game changing pursuit. CS/E applied to sports and cultural activities like fashion, dance, or any number of such areas is a game changer. The same holds true in every field of endeavor, including education. People are why this matters, first and foremost, and that is why strategy is so important. Without an approach that scales human skills and value within the outcomes, we are left with approaches that all too often provide free access in exchange for the potential looting of hidden values not yet explored by schools, families or kids at young ages. Instead, New York can lead the way in showing what sets us apart as world leading regions such as Long Island is. Lets do this New York. Let's teach the world by starting in our own backyard and building local capacity for the skills the future will be made of... all of them. If you are a leader, and you believe in the personal creativity of Individuals, and the desire to serve causes greater than ourselves, then join us in bringing root empowerment to the kids and families of Long Island, New York today. Learn to program, or choose to be programmed.